Kingdom Cheddar | Kingdom Cheddar, now available in the U.S.
Kingdom Cheddar, now available in the U.S.
Home > Kingdom News > Kingdom Cheddar, now available in the U.S.
19 Aug Kingdom Cheddar, now available in the U.S.
First and only European USDA-certified organic cheese, Kingdom Cheddar, now available in the U.S.
WESTMINSTER, Colo. (December 20, 2013) — Kingdom Cheddar, the first and only European cheese to be certified organic by the USDA, may be the newest entry into the U.S. cheese market, but every bite carries the unique authentic cheddar taste that comes from more than 800 years of English artisan craftsmanship. 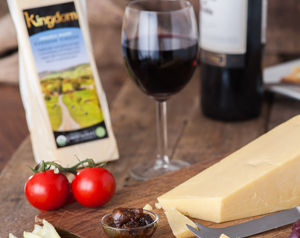 The milk in Kingdom Cheddar comes from a small group of organic family farmers known for their high standards and passionate organic values, in South-West England, where cheddar cheesemaking first began in the 12th century. “We use old-world artisan techniques, conducted under today’s exacting organic standards, which makes for an exceptional product,” said Nicola Turner, Export and Marketing Director at the Organic Milk Suppliers Cooperative (OMSCo,) the largest organic dairy farmers’ co-operative in the UK. OMSCo manages the production of Kingdom Cheddar. “Its premium quality makes it the ideal choice for entertaining, or makes everyday eating – and cooking – a little extra-special,” she added. Kingdom Cheddar is certified to the USDA’s National Organic Standards.